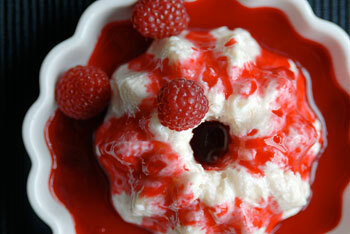 This is such an easy dessert, and looks so pretty. It is soy free and of course vegan. Heat the coconut cream in a saucepan until it comes to a boil. Add the risotto, coconut flakes and sugar and stir until it once again comes to a boil. Reduce the heat to simmer and cook covered, until the rice is cooked (about 30 minutes). Check on the rice from time to time and give it a stir so that it doesn’t scorch on the bottom. Meanwhile, put most of the berries in a 2nd sauce pan, add the water and sugar and bring to a boil. Save a few of the prettiest berries as garnish and if you wish to mix in with the rice. 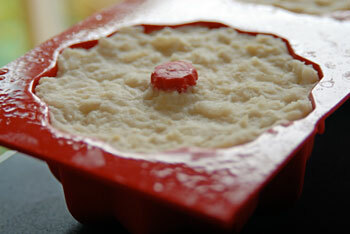 When the rice is cooked, spoon it into a mold or pretty glass. (it would be here that if you want berries mixed in, you should do so. Place the rice pudding in the refrigerator to chill until serving. When the berries have cooked down, push them through a sieve to remove the seeds. Take a bit of the berry juice and mix with the corn starch. Return the berry juice to the sauce pan and add the corn starch, cook a few minutes until thickened. 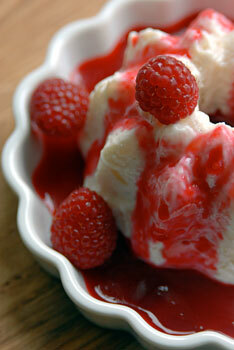 Posted by Chris Walker on September 3, 2007 in Desserts and Sweets, Raspberries, Rice.